Well, since I haven't been very productive lately - mostly due to my resemblance to a wretched plague-bearer (this morning when I spoke to my mom, I told her that I was feeling a little better and her reply was something like "Really? You sound horrible. "), here are two posts back to back! Seeing as it's been about a month since I've actually written about Japanese, I wanted to come up with something super awesome and, if possible, totally badass. This naturally made me think of pirates. I've been on and off reading this book about pirates called The Republic of Pirates. It's about several famous pirates and the Golden Age of Piracy during the early 1700's, which largely contributed to our pop-cultural fascination with pirates. I've probably broken an unwritten "writing rule" here by repeating the word "pirates" so many times in such proximity, but that's okay - pirates are cool enough that I don't even care. Pirates pirates pirates. Anyway, there are a lot of cool little tidbits and facts to know about pirates. Like did you know that merchant or navy vessels were actually much more brutal positions for sailors back during the Golden Age? Pirates could be ruthless, but generally pirate crews were better treated than those of "legitimate" ships. If I were to ask you what you think of when I bring up pirates, you might mention a Disney movie or rum (yum), or peg-legged chaps with hook-hands. But I imagine a good amount of you would think of the Jolly Roger - the infamous pirate flag. Here's another fun fact for you - though I'd wager many people don't know the distinction, the Jolly Roger isn't just the term used to refer to the oft-imagined skull and crossbones symbol over a black field. It's actually a catch-all term used to refer to all flags flown to identify a pirate ship. The skull and crossbones is no doubt the most famous, but there were a wide variety of designs. They often featured skulls, skeletons, demon-like figures stabbing hearts with spears, and terrifying imagery like that. They also seemed to mostly use the colors black, white, and sometimes red. So in English, we call the pirate flag the "Jolly Roger." Any guess as to the Japanese? 「ジョーリーロージャー」 maybe? Perhaps something like 「黒死骨旗」(if I were to "invent" the Japanese word for "pirate flag," this would be it - literally "black death bone flag")? Nope - it's actually quite straightforward, like so many Japanese words, which either seem to be super easy to remember and make total sense or else be incomprehensible. To be fair to Japanese, the straightforward ones are a lot more common. 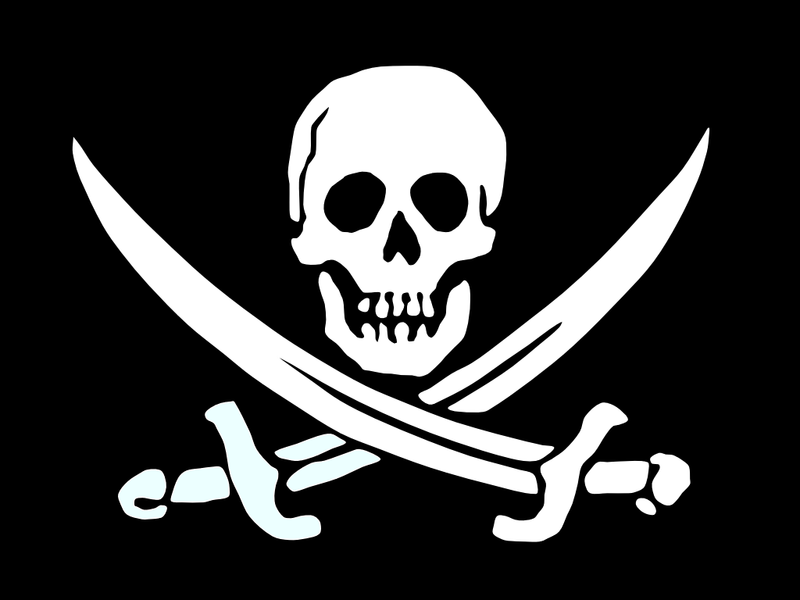 The Japanese for "Jolly Roger" is actually 「海賊旗」(かいぞくき), which quite literally means "pirate flag." I know - kind of a letdown after all that buildup, but look on the bright side - at least I got to write about pirates. Now that you are enlightened, go forth and converse about pirate flags in Japanese. You're welcome.